1. Each team has a sniper somewhere in the stands. Not real bullets, of course. Paint balls. Snipers can take three shots a game. If you’re hit, you must play dead until the final whistle. No head shots! Goalies can’t be targets. Obviously. 2. Everyone carries a pool noodle. For whacking opponents. 3. 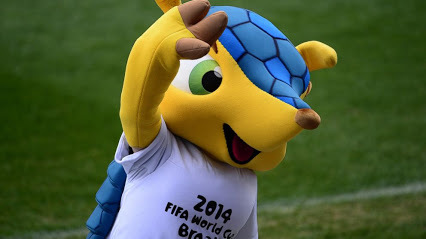 The official World Cup mascot is always on the field. He’s never offsides. And he switches teams at his leisure. 4. During extra time, the ball is lathered in zebra’s blood, and two lions are released. 5. The men of the most recent season of The Bachelorette form a team. They start each game with twelve points. You know, to be fair. 6. Every team can magically summon one fictional character to join their team each game. Batman, Harry Potter, King Kong, etc. 8. One sinkhole per game, no more than two meters in diameter. But it’s magic, so once it forms it never stops moving around the field. 9. During penalty kicks, the goalie selects one of the following weapons: fire hose, peregrine falcon, or Tyrion Lannister. 10. After every game, teams link arms and sing “We Are the World” in their respective languages. The coaches saddle the lions and chase the mascot. Michael Bay directs the fireworks, which are of course fired down onto the field.